R. C. Sproul (1939-2017), theologian, pastor and teacher, was founder of Ligonier Ministries, an international teaching ministry based in Orlando, Florida. He holds doctorate degrees from Free University of Amsterdam and Whitefield Theological Seminary, and is author of more than sixty books, general editor of The Reformation Study Bible and executive editor of Tabletalk magazine. Sproul is senior minister of preaching at Saint Andrew's Chapel and can be heard daily on the radio broadcast Renewing Your Mind. Toward the end of his earthly ministry, Jesus predicted the destruction of the Jewish temple in Jerusalem. His shocked disciples asked when it would happen. Jesus' response, a lengthy monologue about coming chaos and tribulation, forms the Olivet Discourse, an important and controversial text that has drawn intense interest from Christians through the centuries. 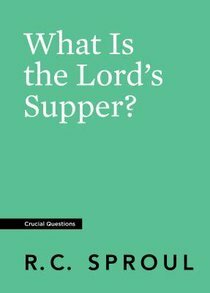 In this booklet from the Crucial Questions series, Dr R C Sproul examines the discourse to glean from it truths regarding who Jesus was, what He really meant, and what His words mean for us today. Pre-Order now to secure your copy. Expected to ship July 2019. Throughout his nearly fifty years of teaching the content of the Bible and theological concepts, Dr. R. C. Sproul has ?majored on the majors? ?the most important doctrines and truths of the Christian faith. As a gifted communicator, Dr. Sproul has helped many believers grow in their understanding of such matters as the nature of God, the history of redemption, and the manner in which we are saved. Now Dr. Sproul?s lucid teaching on these vital matters is available in a series of concise booklets that are perfect for personal learning and refreshing, as well as small-group study. Pre-Order now to secure your copy. Expected to ship July 2019.